City council will vote whether to approve the conversion of western stand to a seating section on July 31. 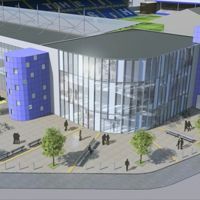 But that’s only a piece of the project that will also see opposite end of London Road Stadium revamped completely. Peterborough City Council and Peterborough United finally reached an agreement on the London Road Stadium revamp (its range signalled red in the satellite photo below), which would have been done a year ago, had the club’s initial plans succeeded. In a £9.5 million investment (£5.5m from governmental funds) the eastern Moy’s End will be rebuilt as a 2,500-seater stand. It’s also expected to house a “Sustainable Skills Centre” to provide vocational training for young people aged 14 to 16. Contrary to the current blueprint, future Moy’s End will also cover the north-eastern corner of the ground. The city council still needs to vote on another spending – a £1 million conversion of the western London Road Terrace to another all-seater section. The changes may see London Road Stadium go down in terms of capacity to roughly 13,000. The club also agreed on a much lower lease for the upcoming 25 years. Annual payments are to drop from £500,000 to £300,000 after the conversion, while another decrease of £4,000 is planned for the reconstruction period. Work is expected to start in September 2013 and be done in a year or so.